Whether you're looking for stress relief, physical therapy, a little pampering or all of the above, a good massage can really hit the spot -- but have you ever considered how the practice might benefit animals as well? It's one of the latest trends to infiltrate the pet industry, and even Hollywood has taken notice: Actress and dog lover Jennifer Aniston has reportedly spent upwards of $250 a week on massages and other treatments for Norman, her 14-year-old corgi terrier mix, to help relieve his aching joints. 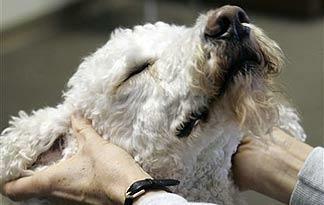 But pet massage isn't just a fad for the rich and famous to indulge in -- any pet owner can give it a try. Here are some insights from the experts to help you get started, including the potential benefits and risks, top techniques, dos and don'ts, and other tricks of the trade. There are many benefits associated with pet massage, including just generally enhancing an animal's quality of life. More specifically, explains Jonathan Rudinger -- president of the International Association of Animal Massage and Bodywork (IAAMB) -- massage helps increase animal flexibility, improves blood and lymph circulation, helps maintain balance, and also promotes a good appetite and sound naps. According to Lola Michelin, director of education at the Northwest School of Animal Massage in Portland, Ore., the list of potential advantages goes on. "Just like in humans, massage helps to relieve pets' muscle tension, stiffness and pain," she says. "It can also help to improve metabolism in overweight animals, relieve nervous tension in hyperactive animals and support the immune system by enhancing circulation of blood and lymph fluids." Both Michelin and Rudinger maintain that most animals enjoy pet massage, especially those that are handled regularly and well socialized. However, dogs, cats and horses are among the most common pet massage clients. During a pet massage, risks to animals can be kept to a minimum if they're in the hands of a trained professional who has been educated on the correct amount of pressure to apply, as well as the proper way to move joints. Michelin also cautions that there are some situations where massage should not be used -- for example, when a pet has a fever, systemic infection or certain heart conditions. For the practitioner, on the other hand, the risks can run deeper. "Like any work with animals, there is always the chance of getting stepped on or bitten," says Michelin. Rudinger agrees, adding, "If a dog is hurting or not in the mood for bodywork, or if the dog is dangerous, snapping and biting may happen. This is uncommon when the practitioner understands and incorporates animal behavior, signs and signals into the session." As with people massages, there are a number of different techniques used in pet massage, including Swedish (a deep tissue approach), sports (focused on flexibility and injury prevention) and hydrotherapies (which incorporate the use of water). Rudinger also teaches a method he refers to as "still-holding," which involves holding a dog but keeping the hands very still to detect tiny muscle twitches and spasms -- this helps him to closely observe what's happening within the canine's body. Most pet massage practitioners recommend scheduling pets for monthly treatments to maintain health, relaxation and overall well-being. Michelin massages performance animals (such as show dogs or racehorses) more frequently, sometimes once a week or immediately before and after a given event. However, it is possible to get too much of a good thing: Rudinger cautions against daily massages, and recommends giving your pet a full 48-hour rest between sessions -- this gives a pet's tissue time to re-integrate. 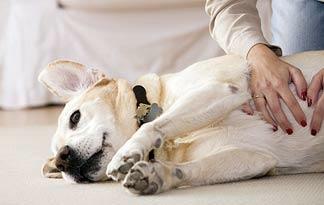 Keep reading to find out how to find the best masseuse for your furry friend. Do you specialize in any particular type of massage or breeds? Can you provide testimonials from other clients? Are you a member of any professional animal massage organizations? Michelin recommends working with someone who has undergone at least 150 hours of training, but cautions that massage should not be used as a substitute for veterinary care. Prices for pet massages should generally be along the lines of those seen for people massages, though they sometimes can run higher depending on where you live or if you're seeking out special services like hydrotherapy. Also, owners interested in saving some cash can learn basic pet massage techniques themselves, though they should consult some references such as instructional books, DVDs and home-study courses before actually giving it a try. Keep in mind that even with a little self-training and practice, getting a massage from you may not benefit your pet in the same way as a massage from a professional would. Rudinger likens the comparison to getting a shoulder rub from your significant other rather than full body massage from a massage therapist -- though it's arguable that both types of scenarios are still appealing, whether it's you or your pet on the receiving end. Maybe it's best to sign up for all of the above. Michelin, Lola. Director of Education, Northwest School of Animal Massage. Personal interview/correspondence. 03/19/2010. Rudinger, Jonathan, President, International Association of Animal Massage and Bodywork (IAAMB). Personal interview/correspondence. 03/23/2010.